Cabo San Lucas is world renowned for its natural beauty. Located at the very end of the Baja peninsula, Los Cabos is privileged to have access to great beaches and many unique land formations including the famous Arch and Lovers Beach. 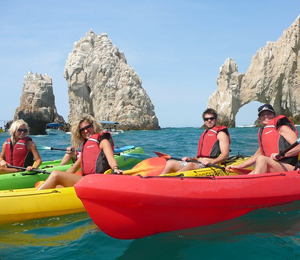 The Arch and Lover's Beach kayaking tour will to Land's End to view the large rock formations in the shape of arches. You will be able to kayak among them and then head to Lover's Beach to enjoy the pristine powder-sand beach. From there, you will head to Neptune's Finger or Pelican Rock for some of the excellent snorkeling. You will see all kinds of unique coral reef species and tropical fish species. You will also be given time to explore the rugged terrain just outside of Lover's Beach which includes caves and cliffs. Along with an expert bilingual tour guide, your trip also includes drinks and snacks to keep you hydrated and energized during this one of a kind Cabo experience. I have been to the Bahamas many times, but Arch and Lovers Beach Kayak and Snorkel is one of my favorite trips! It includes everything that everyone should do here. As a Bahamas veteran, I can say only the best about this experience!